The limitations of Night Vision become a thing of the past with the introduction of MATBOCK’s Tarsier Eclipse™. 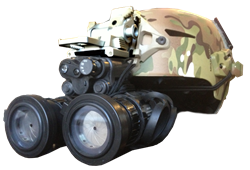 MATBOCK, a Service Disabled Veteran Owned Company dramatically improves Night Vision capabilities with the release of the long awaited Tarsier Eclipse™. Night Vision Goggles (NVGs) have distinct inherent limitations. Among those limitations is the ability to only focus at one specific distance, not various distances at the same time. Much like a camera, when focused out on the horizon, images very near become blurry and vice versa. To solve this problem, many soldiers poke small holes in the end of their protective covers. This simple change creates an autofocus effect where the soldier can now see objects both directly in front of him or her as well as all objects out to the horizon. The limitation of this small hole in front of the lens creates another problem. By decreasing the amount of light entering the NVG, the light sensors cannot amplify the photons enough to create a clear picture for the soldier. This is not an issue when in urban areas with an abundance of ambient light or even on a night with a large amount of moonlight. However, on dark nights or inside building where there is very little light, the NVG image will be very dark and the soldier will not have enough light to see. In order to solve this problem but still retain the autofocus capability, MATBOCK proudly introduces the Tarsier Eclipse™. With an internal optical quality camera iris and a dust proof adjustment ring, the Tarsier Eclipse™ allows the soldier the ability to control the amount of light entering his or her NVGs. By slowly enlarging the iris size, the soldier can increase the amount of light amplified by the goggles, but still retain the autofocus capability. Additionally, the Tarsier Eclipse™ offers a high quality, Corning Glass™ sacrificial lens that can quickly be replaced without tools, protecting the expensive NVG lenses. Imagine driving your car at night and only being able to see 200 feet in front of you, but not having the ability to see an exit sign 400 feet away nor the speedometer directly in front of you. The risk is greater during nighttime combat operations and now our soldiers have a solution to ensure their additional safety and effectiveness. The Tarsier Eclipse ™ solves this problem by allowing the user to see objects at all distances in all lighting conditions. Truly an evolution in night vision technology. The Tarsier Eclipse™ is currently designed to fit various models and more information can be found on MATBOCK’s website.